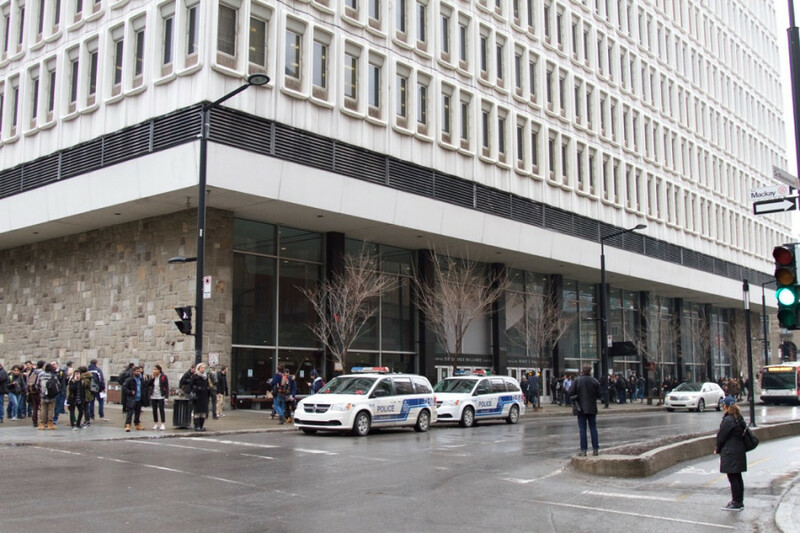 Update: Investigations that began at 10 a.m. by the SPVM at the EV and Hall buildings have finished, and no explosives have been found. Police plan to continue doing investigations into the group behind the threat. Those buildings will be open by 6 p.m. today, as confirmed through the university’s twitter. All classes and exams scheduled after 6 p.m. have not been cancelled, though some teachers are choosing to cancel their classes. 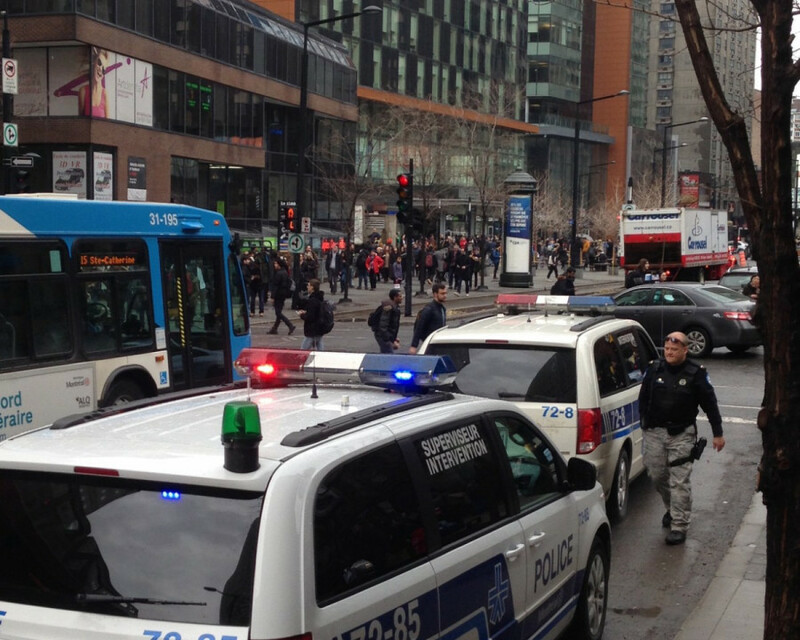 A letter threatening to set off bombs in two buildings at Concordia was sent to the school and various media outlets today. 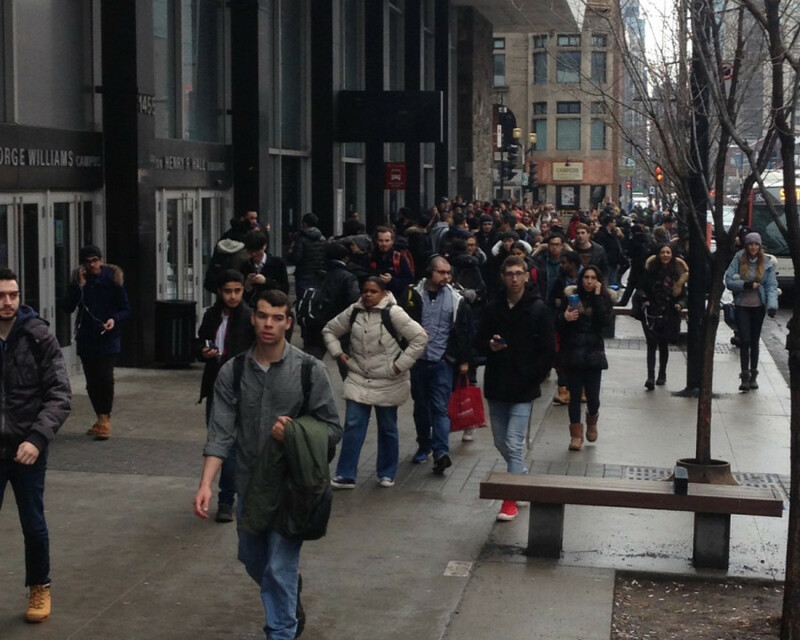 The university issued an evacuation notice to students in the Hall and EV buildings, respectively on Maisonneuve Blvd. and St. Catherine St. 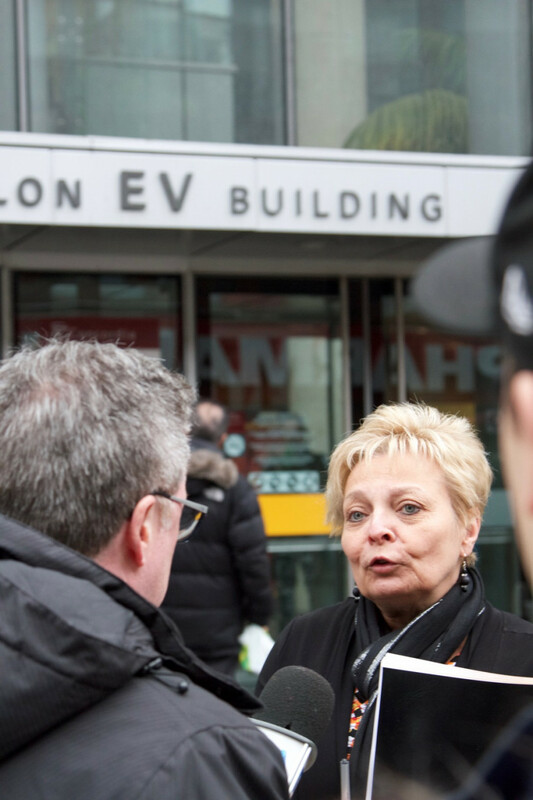 The evacuation began around 11:30 a.m. About an hour later, it was announced that the GM building was being evacuated as well. 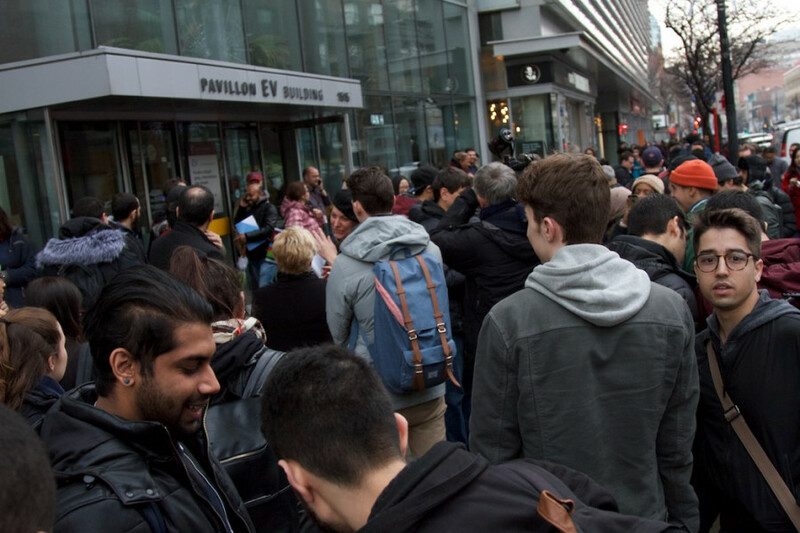 Soon after, the Guy Concordia Metro was closed as well, although service to the station resumed around 12:15 p.m.
Chris Mota, media spokesperson for Concordia confirmed the letter was sent targeting the Muslim community specifically. In the letter, a threat is made to detonate bombs between March 1 at noon and March 3 at 2 p.m for two floors of the hall building and one floor of the EV building. The Concordia Student Union is also implicated in the letter, with the group saying they brought up various concerns to them, but that their concerns were ignored. “It’s from a group we’ve never heard of before,” said Mota, who said she could find no record of the group online. The letter itself implies that the group is made up of students. It calls for Concordia to stop all religious activities on campus. Montreal police are now conducting an on-site investigation of the area. But no perimeter has been set up around the buildings, and many students have been standing around the building. This is despite Mota saying that the school is taking it as a legitimate threat. Julia Sutera Sardo, VP internal for the Arts and Science Federation of Associations, confirmed that the colleges, located in Concordia’s annexes were also advised by security to evacuate, due to their proximity to the university’s Muslim Student Association’s office. According to Bara Aduhamed, a member of Concordia’s Muslim Students Association, the letter was also sent directly to the MSA’s email inbox. The association is holding an Islam Awareness Week throughout the week. 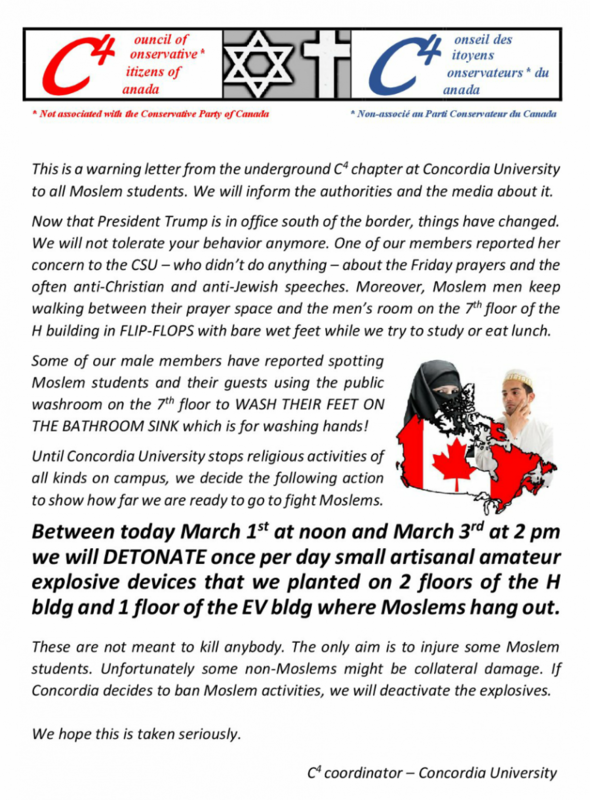 A letter sent to Concordia University, threatening to detonate bombs at the downtown campus, targeting Muslim students. In a statement from the MSA, the threats were called “deeply troubling.” The association said it stands in solidarity with other faith groups, and that it remains committed to promoting safe and respectful communities. “No faith community should have to live in fear about the safety and well-being of its community members,” the statement reads, also noting that the Jewish Community Centre in Calgary was subject to a bomb threat earlier this week. The MSA urged the police to investigate the threats to Concordia as a hate crime, and said it welcomes words of support from Concordia administration and the Concordia Student Union. Lucinda Marshall-Kiparissis, General Coordinator for the CSU, said she feels sickened by the events. “I’m speaking for myself and my colleagues as well that this is is unacceptable and to threaten terror against community members of this university,” she said. Marshall-Kiparissis added that the CSU and MSA have been in contact with the Dean of Students, and the MSA has also been in touch with security. “Everything is happening really fast but we’re going to be looking at how to make some safety net in the coming days,” she said, adding that the CSU will never allow the right for Muslim students to have a prayer space be compromised. Classes at the SGW campus have been cancelled until further notice, but Concordia’s Facebook page said they may resume at 6 p.m.
CKUT, McGill University’s community radio station, also received the letter with a note attached explaining that a similar threat might extend to McGill, explained Tamara Filyavich, the station’s arts and culture coordinator. Filyavich said that although the note did not contain any specific threat, she alerted university security. May I Blank Your Blank?